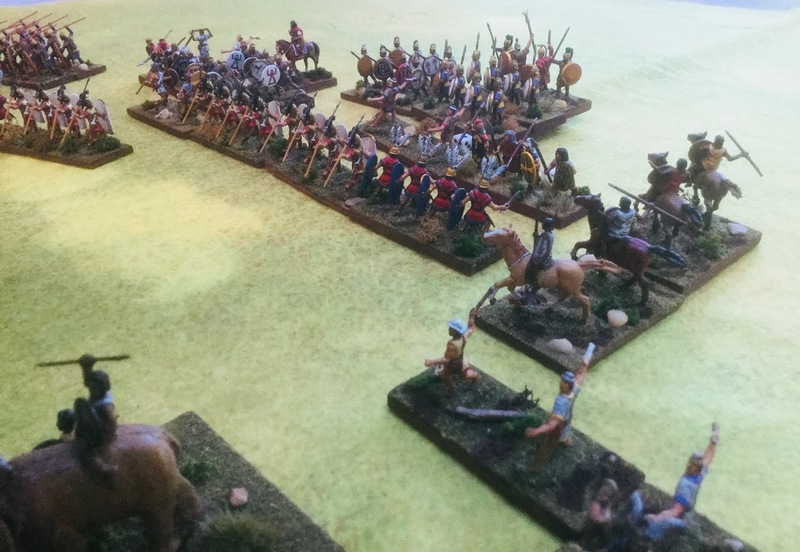 Doing an ancient battle that featured an ambush is no easy task if you want the ambushed to have a fighting chance of victory. Historically, Hannibal pulled off an ambush of a Roman army near the River Trebbia in 218 BC. 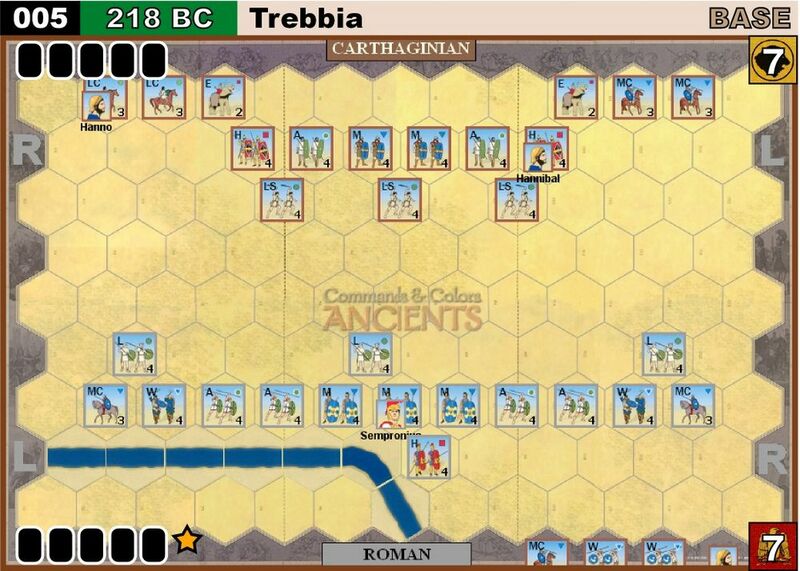 The Battle of Trebia was a resounding defeat for the Romans with only 10,000 of their 40,000 men surviving to fight another day. Hannibal managed to coax the Romans into crossing the icy Trebbia to make a frontal assault on his deployed Carthaginian army. At the same time Hannibal managed to get his brother Mago concealed behind the Roman juggernaut and attack them from the rear just at the right moment. The Roman’s fell into a carefully planned trap. To try and reproduce the battle with my version of DBA I used the map below from Command and Colors Ancients (CCA). 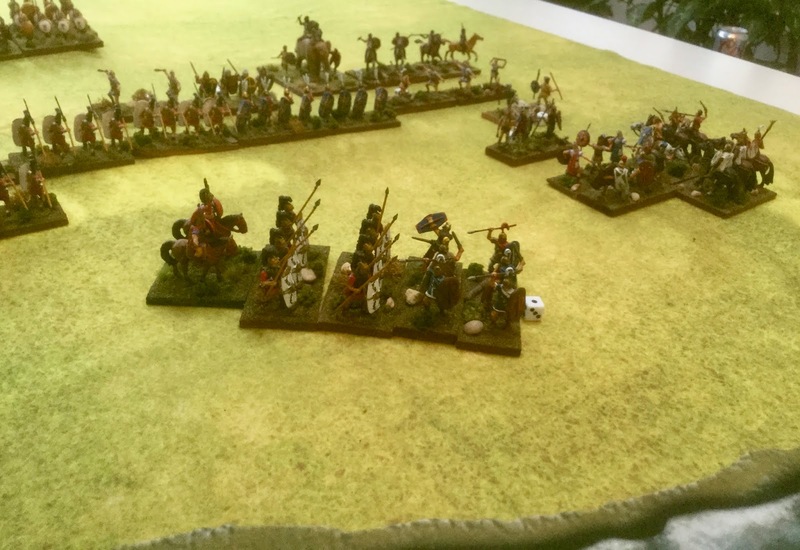 I convert the board game counters into the corresponding elements in DBA and come up with an Order of Battle. 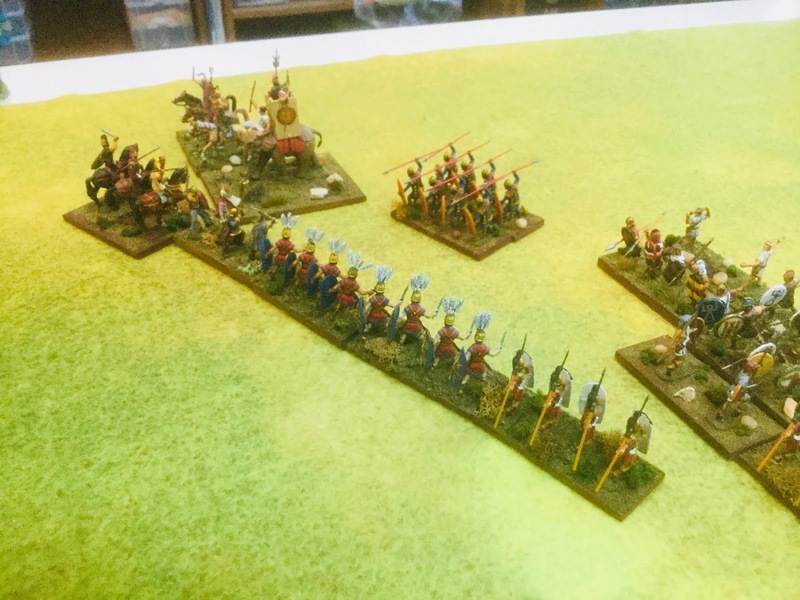 I match the deployment on the elements to the map and set out victory conditions that give, in this case, the ambushed Romans a fighting chance. The Order of Battle is given below the map I copied from the CCA website (lots of free scenarios for ancients there). 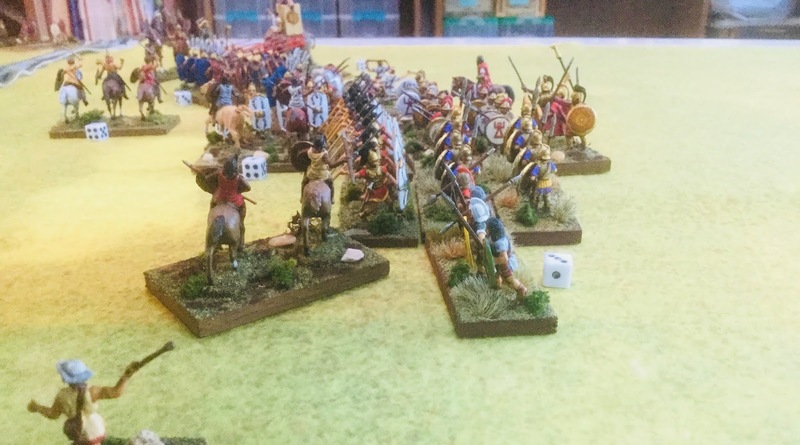 I took pictures of the game but they are not in order and since the game was a month ago I’ve lost the blow by blow which ended up in a Roman defeat. They did have a chance. I will try to caption the pictures for the interested reader. 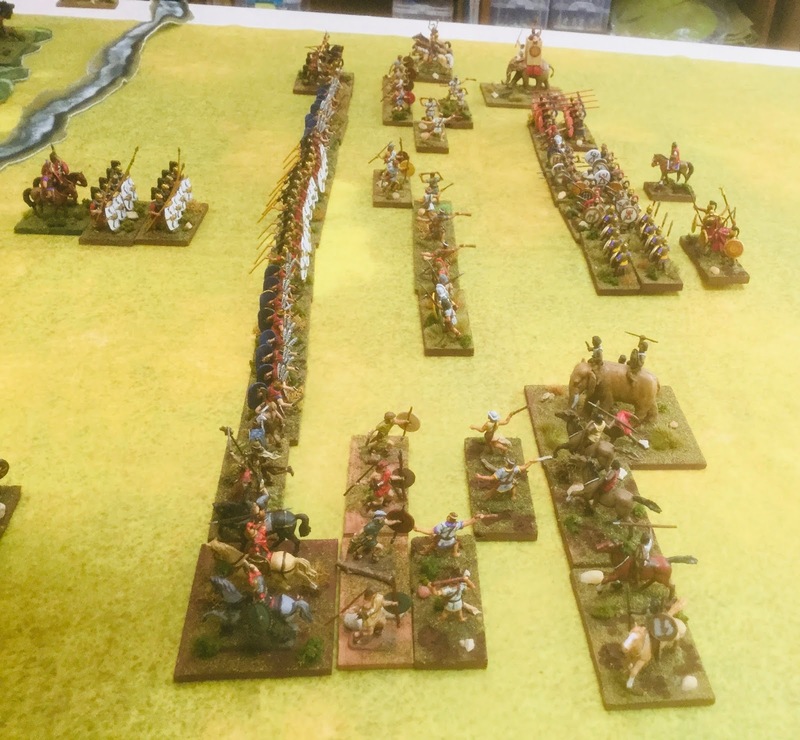 I tried to capture the entire battle line except for the ambush force. The Carthaginians are on the left side of the picture. The double ranked spearmen are in phalanx and represent Hannibal’s Libyans. 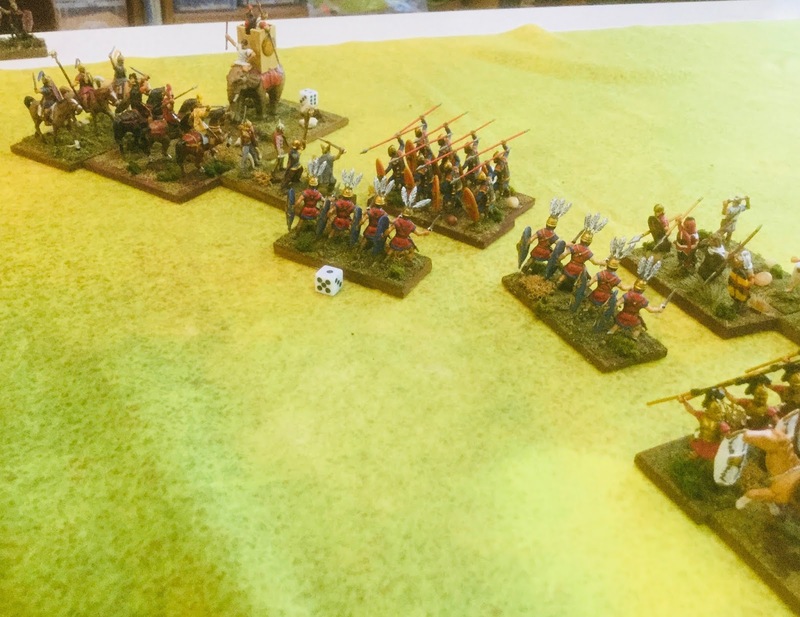 There is Iberian cavalry on the Carthaginian right and Numidian’s on the left with each flank having an elephant to terrorize the Romans. The Romans are on the right of the pictures and have just crossed the river. 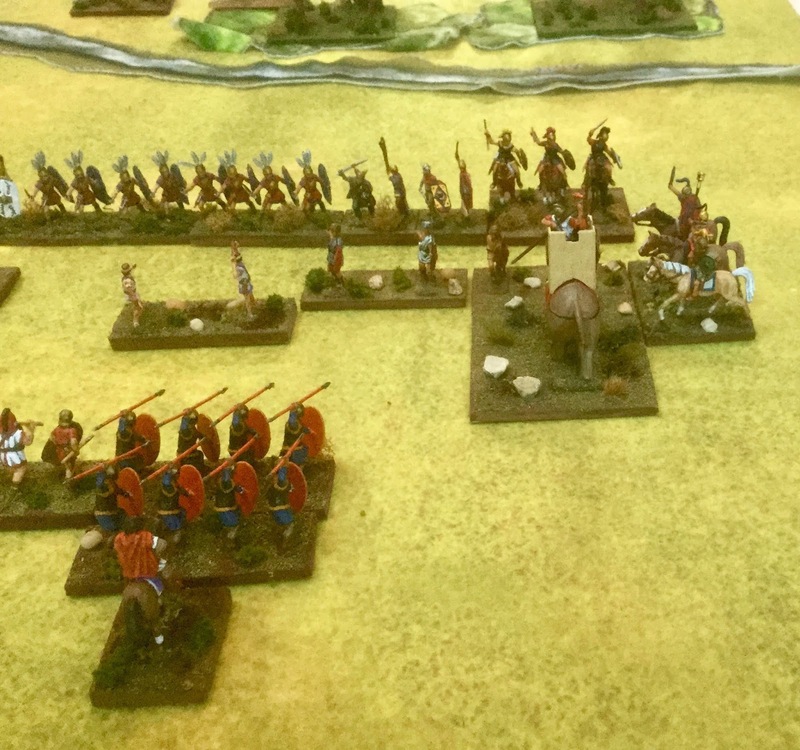 The velites are out front challenging the Balearic slingers and other light infantry. 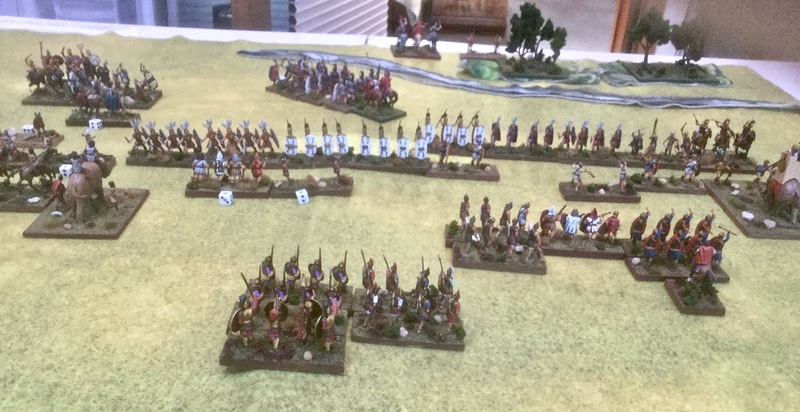 Triarii are supporting the hastatus and princeps and Roman\Italian cavalry are on each flank. This picture flips everything around for a better look. 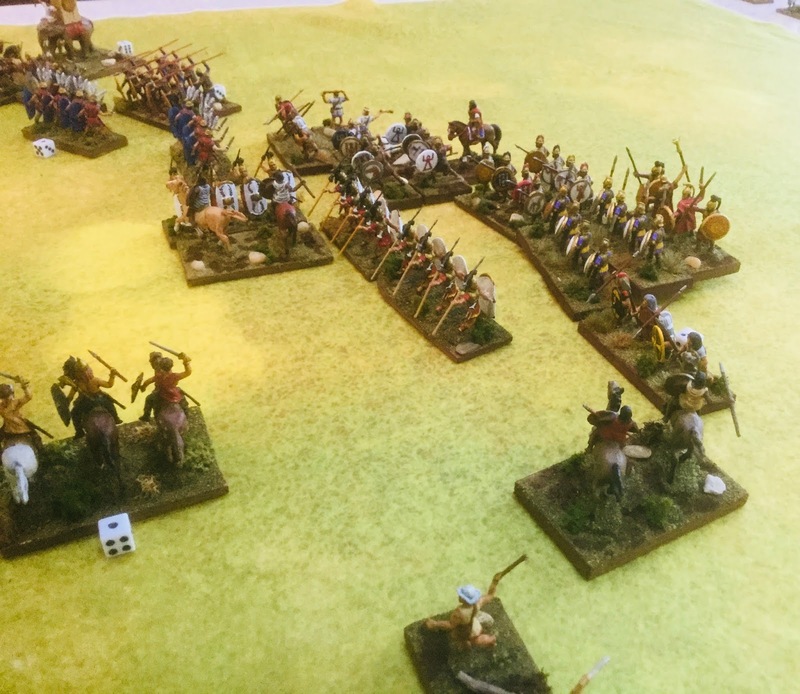 Roman cavalry on the left of the picture have turned to face the emerging ambush force while the Numidian’s are pressing the attack from the other direction! Adjacent to the Roman cavalry is an element of friendly Gauls who are at the moment wishing they were on the other side! View from the Carthaginian side of the field. The Carthaginian phalanx is holding back while the flanks try to close and the ambush develops. Celt cavalry and a couple Wb elements are engaging the Romans causing some elements to try and turn to meet the threat. The Triarii who were in reserve suddenly find themselves in the thick of it with the Celts from the ambush. 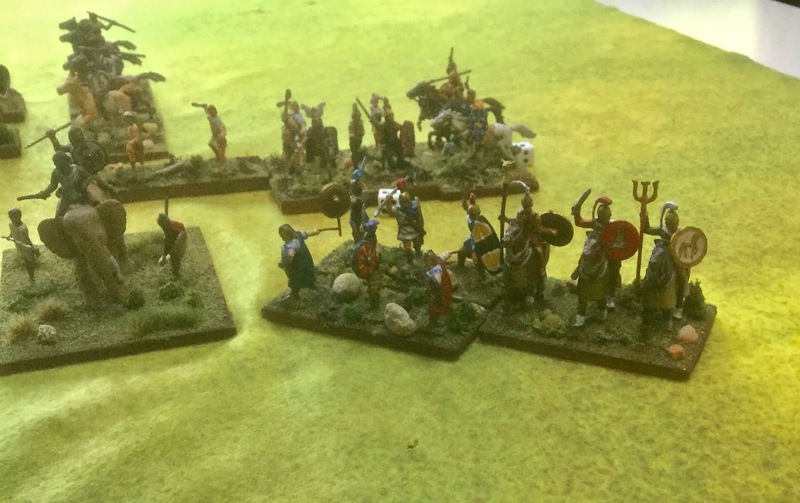 The Roman right is collapsing between the Numidian’s and the ambush force. The small white dice represent recoils. In my DBA version elements are allowed “X” number of recoils before they are destroyed. This is determined by their morale status. The other recoil rules as per DBA 2.2 still apply and my rule simply prevents gridlock. This picture gives a good idea of what the ambush force is accomplishing. Celts have pinned down the Triarii long enough as the other Celt elements help collapse the Roman right. It is hard to fight in two directions at the same time. Oh, that wily Hannibal. 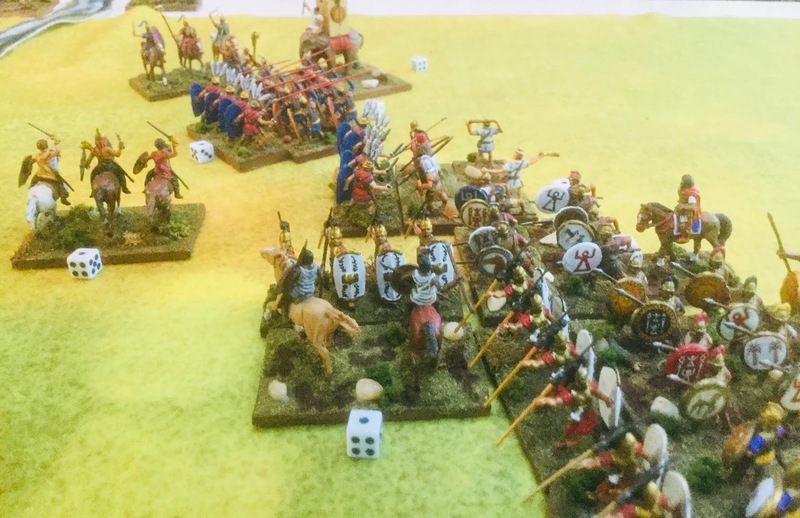 Libyan and Iberian infantry close in on the Roman center. 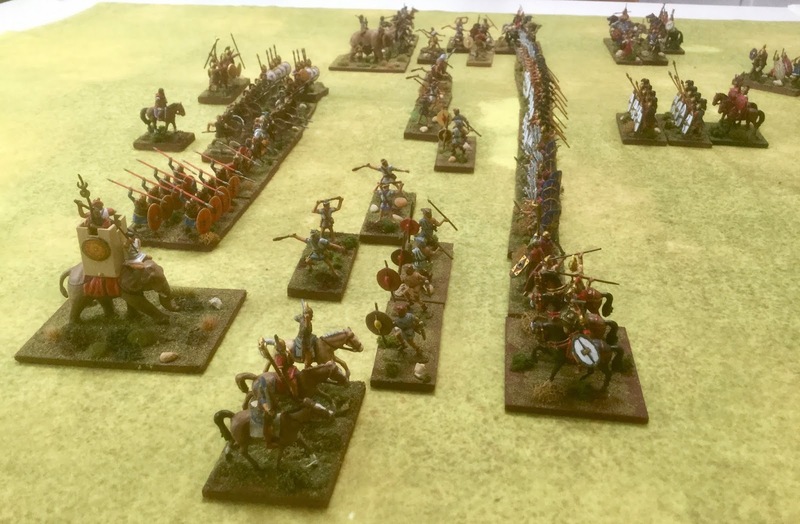 The encirclement is developing-note the Numidian cavalry coming in on the Roman flank. The Roman left held out pretty well keeping the Carthaginians at bay but in the end it was to no avail. 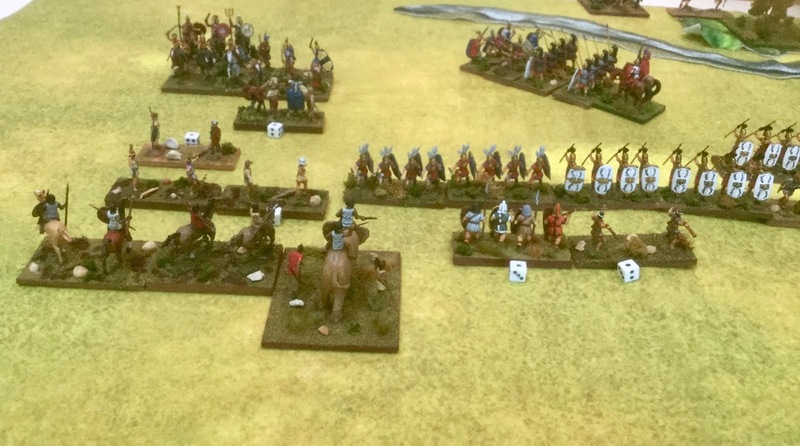 Iberians, Celts, an elephant and Numidian’s all victorious on the Roman right and reorganizing for the final kill. The Roman center being picked apart from the front and flank. The Roman left still holding out but it doesn’t look good. Even the Triarii have been flanked! The Roman center again. It won’t be long now. The game was a great time. It won’t be easy to take on Hannibal the Great. 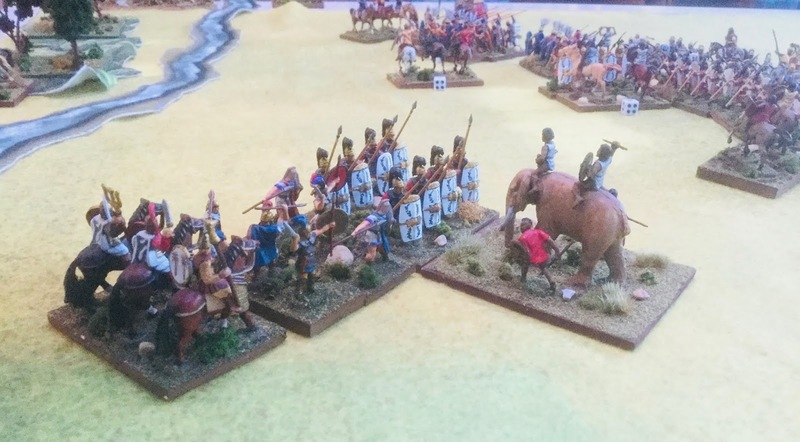 More to come in my Second Punic War series.